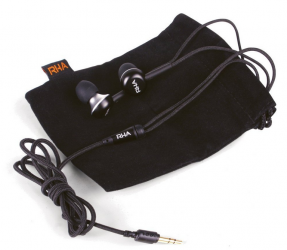 I was recently offered a pair of RHA MA-350 in-ear headphones for review. I brought them with me on a business trip to China, so I had plenty of time on the long flight to try them out and see how they felt after extended wear. Before I get started, I should mention a few things about myself: I enjoy listening to music, but I’m definitely not an audio expert. When I’m planning on purchasing headphones, my main concerns are comfort, general sound quality, and durability. The first thing that grabbed my attention about these earphones was that they were made from solid aluminum. My previous name-brand $40 pair of in-ear headphones were made of plastic coated in a thin rubber sheath, so I was impressed right away with RHA’s use of a durable material. Aside from being more durable than plastic (and having a satisfying “click!” when knocked together), the extra weight wasn’t really noticeable when listening to music. The aluminum construction increased my perceived value of the product, and when I showed the MA-350’s to others, it was the first thing they noticed. These earphones also feature a braided fabric cord which helps reduce cord tangling. The downside is that the braided cord is thicker and a little less flexible than the normal plastic/rubbery stuff, but that did not affect my usage of the earphones. Again, I appreciated the use of higher quality material in these earphones. The cord is a standard “Y” format, where both earpieces have equal lengths of cord which forks from the main connector. My previous pair of headphones featured a behind-the-ear style cord which I preferred, but mainly for the fact that the cords were easier to keep out of my way while working. The only strange decision regarding the construction of these earphones was the way they differentiate between the right and left earphones. A tiny letter is extruded on the rubberized part of the earphones which is pretty hard to see without looking closely. The MA-350 earphones included three sets of interchangeable earpieces: small, medium, and large. I’ve listened to music for many hours using the RHA MA-350 earphones, and I’ve found that the sound they produce is extremely clear, crisp, and accurate. I had previously grown accustomed to the bland, muffled sound of typical lower-end headphones, so the MA-350’s presented a stark contrast which, at first, sounded almost unnatural because of its clarity. The MA-350’s excelled at producing clear treble tones, and offered tight-but-surprisingly-full bass for their size. For most of my testing, I listened to music that presented a wide variety of audio conditions, such as Deadmau5, Regina Spektor, and the wonderfully eclectic Bastion soundtrack (side note: Bastion is a fantastic game). With these samples, the MA-350’s excelled at producing clear treble tones, and offered tight-but-surprisingly-full bass for their size. One of the best features of these earphones is that they provide solid noise isolation. The earphones fit snugly in my ear using the default size earpiece, and I could keep my music at a much lower volume than with my previous pair of earphones because of the improved isolation. This might not be a big deal when sitting in a quiet office listening to music, but it’s a lifesaver when sitting on a long international flight. The MA-350’s came with a nice carrying pouch. I wore these earphones in bursts of about 1-2 hours at a time during my flight, mainly listening to music and playing Bastion for iPad. Overall, they were very comfortable, although for long sessions I’d usually prefer to wear over-ear headphones (which RHA also makes). The MA-350’s in-ear earpieces are very solid, and compared to my previous pair (which were nearly gelatinous), the RHA earphones caused a little more “ear fatigue” than I was used to. 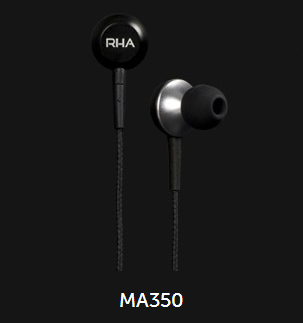 Overall, I’ve been extremely impressed with the RHA MA-350 earphones. I carry them with me at all times in my laptop bag, and I keep them within reach whenever I’m working on my laptop. My expectations for in-ear headphones are typically lower because of the limitations of the form factor, but the MA-350’s definitely stand above earphones I’ve previously used for the same price. In addition to the black earphones I sampled, you can also upgrade to the MA-450i series which include an inline volume control and microphone (and are also available in white). The MA-450i includes 7 different earpieces, offering much more customization than the MA-350’s. You can buy RHA earphones directly from Amazon, and you can now purchase them from Apple either online or in their retail stores.